Kansas guard Charlie Moore (2) fights for a ball with Emporia State forward Justin Washington (24) and Emporia State guard Jack Dale (22) in front of KU forward Dedric Lawson during the first half of an exhibition, Thursday, Oct. 25, 2018 at Allen Fieldhouse. The small ShotTracker sensors both teams used during Thursday's exhibition can be seen on the shoelaces of Washington and Lawson's right feet. The Kansas men’s basketball program, for the first full season, is using the growing ShotTracker technology as part of its daily routine. But there’s much more to KU’s increased experimentation with technology than the ShotTracker name suggests. 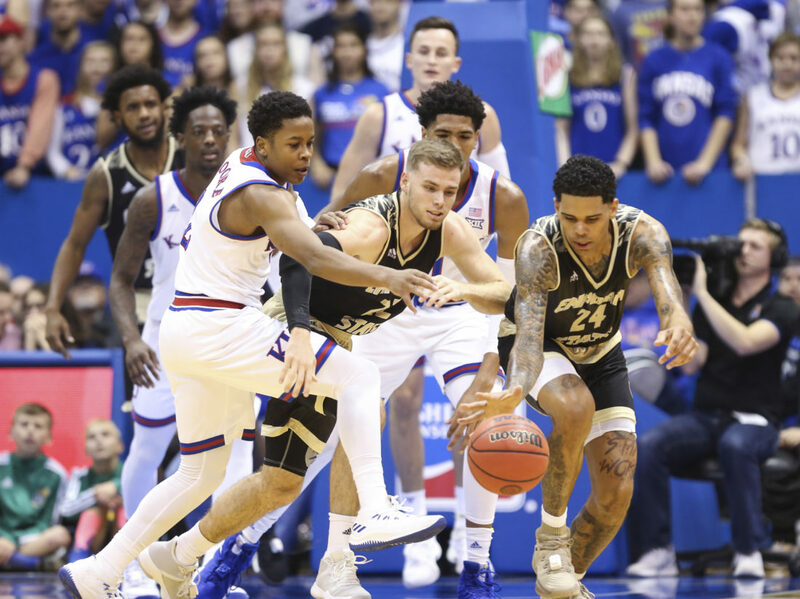 In fact, ShotTracker, which both KU and Emporia State used during Thursday’s 93-55 exhibition victory by Kansas at Allen Fieldhouse, is far from the only technology-based tracking system the Jayhawks are utilizing this season. The ShotTracker technology at Kansas is now integrated with Key Motion software, a pairing that merely enhances the available analytics. Additionally, strength and conditioning coach Andrea Hudy continues to outfit the KU weight room with the latest technological advances aimed at maximizing the production and effort of KU’s athletes, while also using advanced electronic devices to track, treat and help prevent injuries. Founded in 2013, the ShotTracker system was first used by the KU men’s basketball program last season, with an initial installation and a few kinks worked out along the way. This year, it’s all systems go, and the technology already is paying dividends for the players who wear small sensors attached to their shoelaces — often color-coded to match their shoes — and then play with a ball outfitted with a small electronic chip. Cameras are then installed in the rafters and around the court and the sensors capture all of the movement and data in real time. The ShotTracker technology boasts that the ball and players are measured successfully within 3 centimeters of their location on the court and the motion is recorded by cameras that fire at 120 frames per second. Both KU and Emporia had to agree to use the ShotTracker system for Thursday’s game because it doesn’t work unless everyone on the court is hooked up with the sensors that track the data. Few players have benefited from the system as much as Moore, who recently was able to see, in crystal clear, color-coded data, that he shoots nearly 70 percent from the right side of the 3-point arc and closer to 50 percent on the left side of the arc. 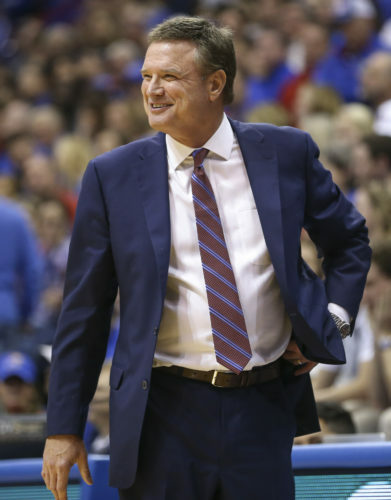 Those figures were spit out basically instantaneously during one of KU’s recent unguarded, catch-and-fire shooting drills routinely performed each week by the Kansas guards. 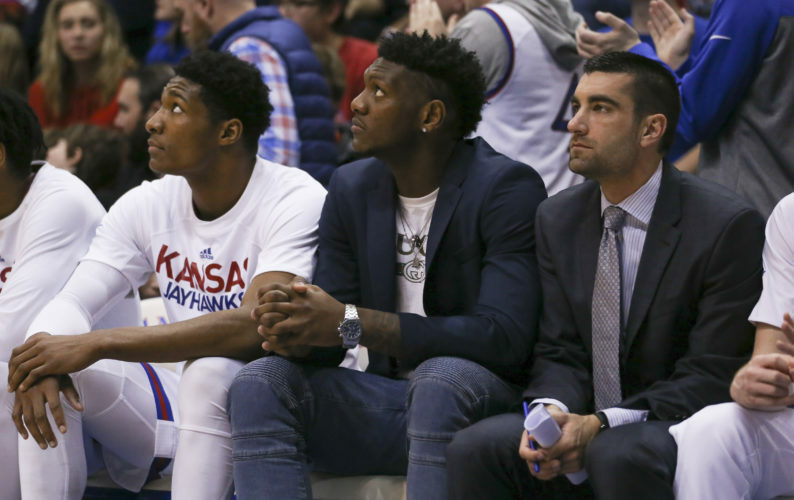 But there’s more to the Jayhawks’ recent technology spike than just seeing the eye-popping number or bright red glow on the players’ individual iPad screens. 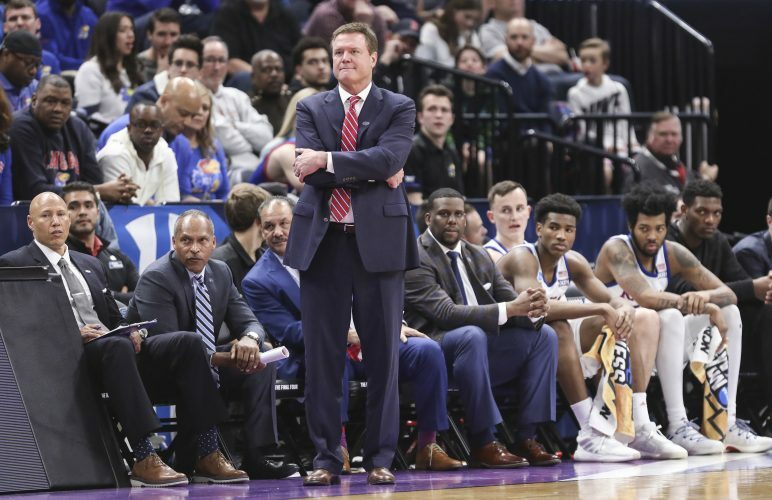 Video director Jeremy Case, who played for KU coach Bill Self from 2003-08 and now is in his third year on Self’s staff, was instrumental in helping KU integrate ShotTracker and the Key Motion and Sportscode video systems into the team’s regular practice plans. In his day, Case said he and his teammates did things the old-fashioned way by coming in and watching game film the day after they played. They never looked at practice box scores the way the current group does. And Case said the fact that today’s Jayhawks benefit from the combination of video replay and analytic data has been a big hit. It’s one thing to know you shoot better from the right wing than the left. But to actually see how you got there and where you’re standing when you release the ball has taken KU’s practices and player development to a whole new level. Like Moore, Garrett, too, has learned plenty from his early work with ShotTracker, Key Motion and Sportscode. Asked to share his most valuable lesson, Garrett pointed to a specific area on the court. Now that he is armed with the data and video feedback to support the numbers, Garrett said he finds himself more aware and ready whenever he’s in the corner during practices and games. And both he and Moore said they consciously try to get to their so-called hot spots more often all the time. It’s not just the guards who benefit from the ShotTracker technology, though. KU’s big men use it, too. But junior center Udoka Azubuike said it’s not the 3-point arc that catches the attention of KU’s forwards and centers. In all, five or six Big 12 programs have tinkered with ShotTracker on a regular basis. But, to Case’s knowledge, only Kansas — partly because of cost and partly because of the initiative taken by Case — uses ShotTracker in conjunction with Key Motion and Sportscode. The use of ShotTracker during regular-season games has not yet been approved by the NCAA, but next month, at the Hall of Fame Classic in Kansas City, Mo., the software will be utilized for the first time as an in-game tool — complete with shoe senors and iPads on the bench — when Texas Tech, Nebraska, Missouri State and USC play a four-team tournament Nov. 19 and 20 at Sprint Center. 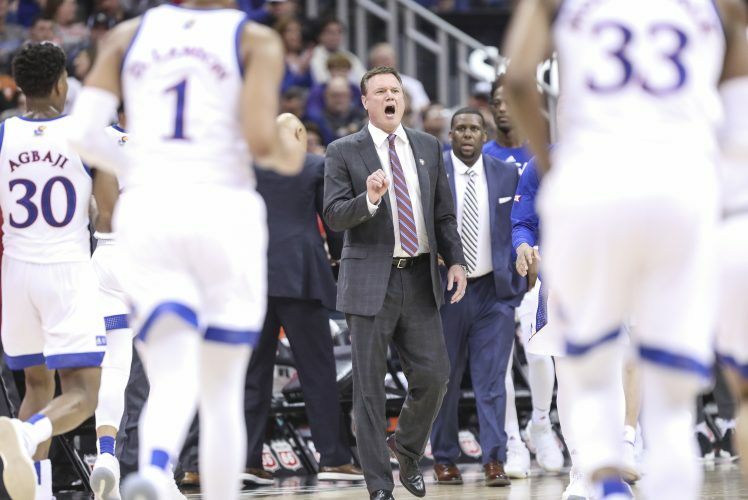 Kansas, meanwhile, plans to use its ShotTracker system again on Thursday, when Washburn comes to Lawrence for the Jayhawks’ final exhibition game of the 2018-19 season.